In WagerWorks Multi-Hand Blackjack with Sidebet, the dealer will always stand on 17. You have the option to double down on any two cards, and you can double down after a split. Re-splitting is not allowed in this game. Split aces receive only one more card and cannot make blackjack. Insurance is available, but you cannot surrender. Any player hand of 8 cards that is not Bust beats any dealer hand except for blackjack. 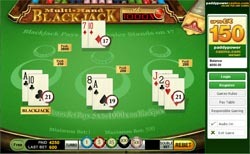 An optional side bet may be placed – this bet is evaluated after cards are dealt, and has no effect on the eealer hand. If a player’s hand is dealt blackjack, the side bet pays out at a random amount. The minimum bet amount in WagerWorks’ Multi-Hand Blackjack with Sidebet is €/£1, and the maximum is €/£1000. Side bet limits are €/£1 to €/£250. All wagers are placed using chips, and these come in 5 different denominations to make it easy for you to bet the exact amount you want. Payouts are calculated as follows: blackjack pays at 3:2, insurance at 2:1, standard wins at 1:1, and all ties push. The optional side bet pays out a random amount from 5x to 1000x on player blackjack. WagerWorks Multi-Hand Blackjack with Sidebet looks a little different than other WagerWorks blackjack games, but the gameplay is just as smooth and easy as all the rest. The major difference here is the card – on half of them looks like a regular playing card, and the second half is a closeup of the number-suite combination. This is a nice improvement, because it makes the cards much easier to read. All the classic WagerWorks touches are here, from subtle card animations to a beautiful, realistic playing area. Bottom line: this game looks and plays great. While this is more or less a classic Multi-Hand Blackjack game, and you can use the usual betting tables to help you play, the sidebet is a different story. Not only is it dependent upon you being dealt blackjack, which we all know doesn’t happen very often – but the payout is random, so you might win huge, or you might just win a little. If you are feeling lucky and want to use this feature, we suggest you bet small. Multi-Hand Blackjack with Sidebet is another great addition to the WagerWorks Blackjack lineup. It’s not so different from the standard Multi-Hand Blackjack, but the Sidebet sets it apart. While that’s not enough to make or break this game, it stands strong enough on its own, and we definitely consider it to be a winner!